Chess-Brabo: How much time do you spend at chess? 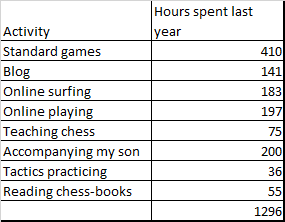 How much time do you spend at chess? As many families today I and my wife work full time. Besides that we have 2 small children, a large to be renovating house built in 1969, lovely garden,... and you get the picture that it is always busy. On top we can't rely upon help of the family or family-in-law due to the large distance. Finally my wife doesn't drive by car so all transport can only done with my help. So I always lack time. Still I manage to the surprise of many (see e.g a reaction of Valery Maes) to keep playing chess. The time spent at standard games is split into 4 sub-categories. - The number of hours analyzing a game. I only took into account the hours which I spent myself at the computer. However my engines probably analyze 5 times longer. The complex algorithm which I use, is explained in analyzing with a computer. The analysis can be split into 2 hours of research in the databases + initializing the engine to study openings, 1-2 hours checking each move + initializing the engine for additional analysis of the middle and end-game. Finally 1 hour to synthesize the analysis into an easy readable format. 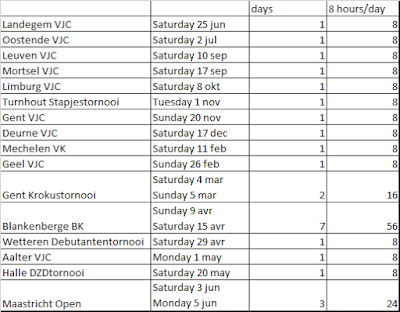 I estimate the time spent for an analysis of my games played in the Belgium interclubs longer as the games are of a higher quality than the others. - As the games are not played at home, some time is lost due to transport. If more than 2 games are played at the same day then there is often some idle time between the rounds. In open tournaments like Gent and Leuven you often have to wait for 3 hours between the rounds. More time must be spent at the prize-givings. The clubchampionship of Deurne wastes the least non-playing-time as only 1 game per day must be played and the club situates within a half hour drive from my home. Writing articles also takes time. So I understand very well why few people are willing to spent time writing articles. Besides you also need to do often some research. I win quite some time as I often copy the analysis of my standardgames into my blog-articles. At the demand of some non-Dutch native readers I also try my best effort to translate my more common articles to English. With the help of some online dictionaries I need about 1 hour to translate an article. It is not Oxford English but despite the mistakes a number of visitors keep checking this blog. With the exception of a couple of holidays per year I spent every day some time to surf at the internet. Hereby I surely look at many chesssites. Chess.com, chessbase, skdeurne, schaaksite, chesspub are my favorites which I visit often several times each day. There are also a large number of other sites which I visit less frequently. They are a source of inspiration for this blog. I also find it fun to get updated of the latest news or even add a small contribution to a discussion. Nowadays I prefer to play 3 minute games online at Playchess. I don't play anywhere else. As the games are automatically stored I know precisely how many I played in the last year. I almost play exclusively in the evenings. This school-year I started to give courses in KMSK (see an example pawn breakthroughs). I was not able to give many courses as there was a lot of overlap with a number of other activities (interclub, tournaments,...) However I always spent quite some energy into the courses to keep my students interested. I was last year 25 days on the road to tournaments for my son Hugo. I limited the hours/day to 8 but in reality it was often more. At the tournaments I read a book, talked to players and non-players, did some kibitzing and of course made sure Hugo had everything he wanted/ needed. I also want to add the remark that my wife accompanied my son to his interclub-games and the Liga youth-championship of Antwerp. I couldn't join as I had those days my own chess-activities. Chess.com tells me that I spent last year about 36 hours at practicing tactics on their server. If I want to make more than 5 per day as preparation of a tournament then I sometimes visit another server to make there some additional exercises. So in reality I used a bit more time than only the 36 hours taken into account for the calculation. Just before sleeping, I read every evening about 10 minutes a chess-book. I am now busy reading Hans Renette's book about Bird. It is a perfect way to finalize the often hectic day quietly. The hours of reading at the tournaments while accompanying Hugo are not double counted in the above table. So we more or less count 4 hours per day which I spent somehow at chess in the last year. After more than 20 years of chess my love for the game hasn't disappeared yet. Some readers will probably wonder how I manage to free all those hours. We only have 24 hours a day. Well some tasks like cleaning, painting, renovating and even recently once also gardening are all subcontracted to paid people. It also sometimes happens that I don't watch television in the evening. With 6-7 hours sleep I have enough. This means that often I am still busy with some chess-activity till after midnight.